. : Optics & Photonics Focus :: Flat Light from a Flat Diamond :. The deeper we try to look into matter, the larger the experimental facilities seem to become. Paddling against the flow, a new technique from Japan could soon make 3D atomic images affordable by any small laboratory around the world. The possibility to polarize light in optical fibers comes to establish graphene as a likely key player in the future of optical technologies; a new application emerges for this material that rocked the scientific world due to its fascinating properties. Broadband graphene polarizer. Artistic view of a graphene polarizer turning unpolarized light (left) to horizontally polarized light (right) at multiple wavelengths (colors) simultaneously. Courtesy of K.P. Loh's Graphene Lab, NUS, Singapore. Harder than steel, more transparent than glass, and a better conductor than silicon and copper to boot. Since it was first isolated in 2004, graphene has stirred a lot of excitement in the scientific community, and earned Andre Geim and Konstantin Novoselov the 2010 Nobel Prize in Physics. Despite the enormous anticipated technological impact of graphene, however, there have been no groundbreaking applications yet. But now, there may be an important technological application on the horizon: Kian Ping Loh from the National University of Singapore has led an international team of researchers to develop a broadband graphene polarizer. This device can easily be used with optical fibers and shows that graphene is not only suited for electronics, but also for optics. Thus, graphene is likely to be used in future generations of optical communication devices and photonic circuits. Graphene is essentially the two-dimensional sibling of diamond. Diamond is a highly regular, three-dimensional arrangement of carbon atoms in the shape of a triangular pyramid. Graphene is also a highly regular arrangement of carbon atoms, albeit in a two dimensional, hexagonal honeycomb lattice, similar to the pattern of chicken wire. In nature, graphene occurs in graphite, and is therefore often referred to as a single layer of graphite. At the moment, graphene is at the center of intense scientific research. It is one of the strongest and hardest materials in the world, exceeding even the legendary hardness of steel or diamond. Its electrical conductivity is far superior to that of silicon, and it could be used as a transparent, highly flexible conductor. Of course, the prospective technological applications of such a material soon fueled the imagination of scientists and engineers alike. This quickly led to a great and ongoing worldwide effort to develop scientific and technological applications for graphene. "We always expected graphene to have an impact on electronics, but now it looks like it will have at least as big of an impact on optoelectronics!" comments Antonio Castro Neto, from Boston University. "Graphene can polarize electromagnetic radiation over a wide frequency range," says Loh. In fact, current polarizers are usually optimized for a rather specific frequency range, which, as a result, reduces their applicability in telecommunications technologies. "The potential application of graphene in telecommunications was one main reason for our research," Loh explains. But Loh and colleagues’ polarizer would not be limited to telecommunications, he insists, "this kind of graphene-based polarizer may have the potential to be used in photonic circuits." To understand how graphene can polarize light, let us take a few steps back. Polarization is a natural phenomenon associated with light: electromagnetic waves, such as visible and infrared light, are typically described using an electric and a magnetic wave oscillating perpendicularly to the propagation direction of the light beam. By convention, the polarization of the light beam is the direction in which the electric field oscillates; for example, if the electric field always oscillates vertically, the beam is said to be polarized vertically; equivalently, if the electric field always oscillates in any other constant direction, the latter is called the polarization axis of the light beam. Basically, by definition, an electromagnetic wave is polarized whenever its electric field has well-defined directional properties. By contrast, a light beam without well-defined electric field properties, such as the light from a light bulb, is called unpolarized. A polarizer, as its name suggests, is a device that polarizes light: light enters from one side and what exits at the other side is polarized in a specific direction. The rest of the light is either absorbed or reflected away. Today, polarizers are used in many applications. Most prominently, Liquid Crystal Displays (LCDs) are essentially a sandwich of two polarizers with a liquid crystal in between. The segments of the liquid crystal modify the polarization of the light depending on an electric field. In this way, an LCD can show black or white pixels and therefore constitutes a screen. Conventional (absorptive) polarizers are typically based on polymers that are aligned along a given axis and absorb the polarization in this axis, leaving the light polarized in the orthogonal direction. "Traditional polarizers generally have a cutoff wavelength since there is a cutoff for thickness and width," Loh explains. In fact, it turns out that the physical polarizing mechanism often depends on the wavelength of light. This implies that such polarizers can only be used for certain wavelengths, which limits their use, particularly in telecommunications applications, in which broad spectra of wavelengths are advantageous. And this is precisely where Loh’s graphene-based polarizer would excel. In essence, the polarizer proposed by Loh's team consists of the lower half of an optical fiber and a single flat layer of graphene on top of this flat surface. More specifically, their fiber is polished in order to remove the top side of the cladding up to 1 micron into the fiber core. Onto this surface, the researchers deposit a single layer of graphene. The experiments showed that this arrangement polarizes a very broad range of wavelengths from visible light to near infrared. In Loh and colleagues’ example, light polarization in the plane of the graphene sheet is transmitted while the perpendicular polarization is suppressed. 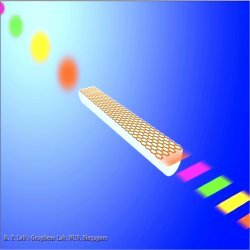 "Actually," as Loh elaborates, "the real mechanism is that the out-of-plane polarization (TM) of light is not well supported in pristine or slightly doped graphene, which leads to relatively larger loss, whereas the in-plane polarization (TE) of light is well supported and thus has a smaller loss. This is the reason why we get a TE-pass polarizer." However, as he adds, it is also possible to produce TM-pass polarizers by using highly doped graphene, because it favors out-of-plane polarization. Loh sees many advantages of their polarizer over other commercial products. For instance, graphene polarizers can be fabricated relatively easily and at low cost. Moreover, their polarizer’s resistance to oxygen, humidity and acid is much better than that of many other polarizers. Furthermore, graphene could be used in flexible, stretchable and foldable photonics devices, not generally the case with other approaches to producing polarizers. "Loh’s polarizer is an interesting application with many interesting extensions," says Castro Neto. "In fact, the biggest plus of graphene is that we can modify its electric properties externally, and that there is a 1:1 correspondence in its electrical response. In this way we could, for example, also build new sensors, and a variety of other applications." AN is a SU2P Research Fellow working on quantum networks at the University of Stanford, California, USA. Qiaoliang Bao, Han Zhang, Bing Wang, Zhenhua Ni, Candy Haley Yi Xuan Lim, Yu Wang, Ding Yuan Tang & Kian Ping Loh, Broadband graphene polarizer, Nature Photonics (2011) 5, 411-415 (link).